Acidophiles are typically isolated from sulfaterich ecological niches yet the role of sulfur metabolism in their growth and survival is poorly defined. Studies of heterotrophically grown ‘‘Ferroplasma acidarmanus’’ showed that its growth requires a minimum of 100 mM of a sulfate-containing salt. Headspace gas analyses by GC/ MS determined that the volatile sulfur compound emitted by active ‘‘F. 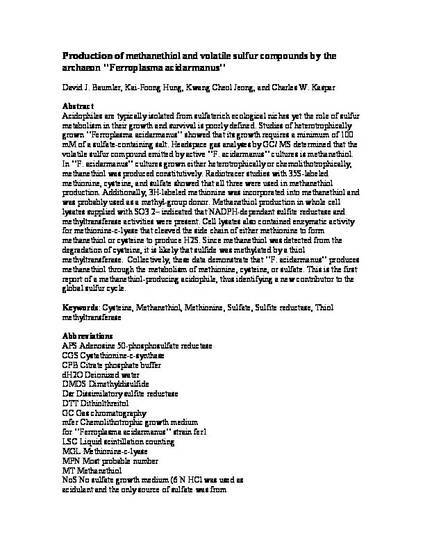 acidarmanus’’ cultures is methanethiol. In ‘‘F. acidarmanus’’ cultures grown either heterotrophically or chemolithotrophically, methanethiol was produced constitutively. Radiotracer studies with 35S-labeled methionine, cysteine, and sulfate showed that all three were used in methanethiol production. Additionally, 3H-labeled methionine was incorporated into methanethiol and was probably used as a methyl-group donor. Methanethiol production in whole cell lysates supplied with SO3 2– indicated that NADPH-dependant sulfite reductase and methyltransferase activities were present. Cell lysates also contained enzymatic activity for methionine-c-lyase that cleaved the side chain of either methionine to form methanethiol or cysteine to produce H2S. Since methanethiol was detected from the degradation of cysteine, it is likely that sulfide was methylated by a thiol methyltransferase. Collectively, these data demonstrate that ‘‘F. acidarmanus’’ produces methanethiol through the metabolism of methionine, cysteine, or sulfate. This is the first report of a methanethiol-producing acidophile, thus identifying a new contributor to the global sulfur cycle.